Installer files can be cached locally and re-used between installs. To use the cache, you can open the Preferences window and set the Cache Path to a valid destination. This is compatible with GOG games. A new installer task is available: install_cab_component which installs a specific component from a cab archive. This allows installing Windows Media Foundation in the GOG Darksiders Warmastered Edition installer ( https://lutris.net/games/darksiders-warmastered-edition/ ) and enjoying working in-game cinematics. Look at the Darksiders installer and give it a try on other MF based games! Lutris 0.5.0 beta 3 running on Kubuntu 18.10. For me, the biggest highlight is still the GOG integration. Being able to pick a game, add it to my library and download it direct from GOG and have it in one place is sweet. Since GOG are dragging their feet on supporting Linux with GOG Galaxy, it's made it less of a hassle. I'm actually more likely to use GOG because of this! While not everyone is a fan of clients, I personally am for the convenience. Great work Lutris team, it's really coming together nicely now, the dark theme is fantastic too so much easier on the eyes to work with. See the release announcement here. I cannot wait to try this out when I get home. As soon as there is the final release I will update my current 0.4.23 version. 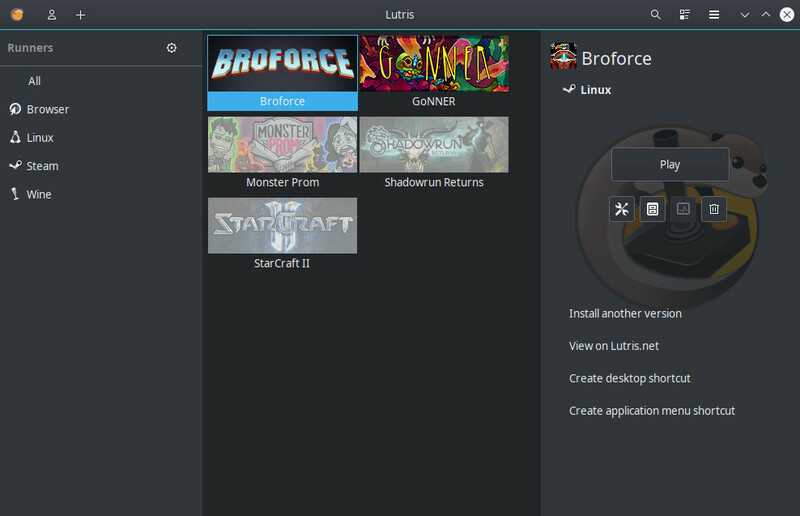 I installed the Origin client with Lutris. And over this then Battelefield 1 and Battlefield V. Runs super with about 60 and 50 fps. I'd use it if it wasn't Linux only. As it is, Lutris is almost as useless to me as that Windows-only equivalent (forgot the name). TheSHEEEP I'd use it if it wasn't Linux only. Why? You don't use Linux? If you do, I don't understand your reasoning. I use Steam on Windows. I use Steam on Linux. Same for pretty much every piece of software I use. Hell, I even have a Chrome plugin to make sure I have the same tabs open wherever I open the browser. I stopped using GOG because I have no hope it will ever come to Linux. When I switch platforms, I don't want to switch the software I use (well, other than the OS, duh). Out of curiosity does anyone know how this GoG feature handles game updates? Like can it/will it notify you when there is an update? Or will it let you check for updates/apply updates to GoG games installed through this integration? I'd try it out if it didn't have CSD. Those things are the worst. Which one btw? Playnite or Launchbox (AKA big box)? While I get your reasoning (and like cross platform apps as well), this has to be the first criticism I've seen in the Linux world aimed at an app for being a Linux exclusive. Wow! And not using it because it uses CSD (I presume you mean client side decorations)? Um, ok, your choice. I personally use Lutris quite a bit. It is perfect? No. Are there bugs here and there? Sure. But I have always found both the app and the enormous contributions of its dev (Wine-staging) and community (all those install scripts and super friendly and helpful Discord channel) to be invaluable to the Linux gaming world. I back them on Patreon and recommend others do as well. name of chrome extension ?